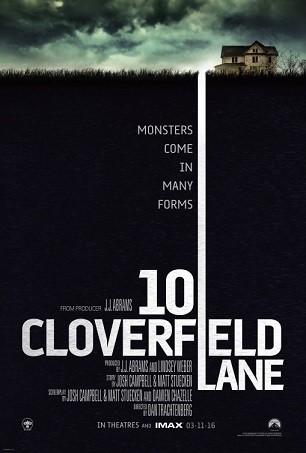 Paramount Pictures releases 10 Cloverfield Lane nationwide on March 11th, 2016. NYC MOVIE GURU: How challenging and important was it to find levity? What do you think is so appealing about dark themes? Matthew Stuecken: I think in any movie like this, you need to give the audience a break. If you keep them feeling like something bad is gonna happen every second of the film, it becomes too much and you tend to become numb to it. We were lucky to have worked with such a confident first time director and such great performances so you’re in this bunker for so long but you want to be there. They’re such engaging people and I think that’s a testament to the work that the actors and the director did. Josh Campbell: The actors found stuff that we didn’t always necessarily see in some of the lines, which really elevated them beyond anything we can hope. Dan Trachtenberg: There are two awesome quotes from Wes Craven that were very inspirational to me, specifically to this movie. One was that “horror movies are boot camps for the soul” and that “horror movies don’t create fear, they release fear” and I think the thing about that, especially with this movie is that it’s very much about the fear of the unknown and so much in life is very overwhelming because we don’t know how things are going to turn out. To be able to see a movie that is really put through the paces and have this very intense and exciting experience to know you will come out the other side as victorious is very useful to us and is something to cathartically release all of those fears through. I think that will always be attractive to people, to kind of release all those tensions you get in life. John Goodman: Kind of like getting on a 6 train in the morning! NYC MOVIE GURU: What inspired the concept of 10 Cloverfield Lane? MS: It actually started where I just had an opening scene for this idea in my head, and Josh and I were working separately at that point, and I pitched him the idea of that opening scene and he liked it so much that we decided to collaborate on it, and it was the first project we had done together, and less than two months after we started writing it was when Bad Robot and Paramount had decided to acquire the screenplay. And we were so excited ‘cause you just can’t do better than Bad Robot. So it was pretty amazing. NYC MOVIE GURU: Was there any concern or challenge about selling a script that only has three main characters? JC: I think we thought there was a real market for small, contained thrillers that maybe have really big ideas. I think that’s the same thing that J.J. Abrams and Paramount saw in it. Honestly. We sat down to write something that we thought was very makable. We hoped it would end up this way. We knew Bad Robot was the perfect home for it, but we didn’t dare to dream that high when we were writing it. NYC MOVIE GURU: What's the main difference between working on a set with a few actors like in the film vs many actors in other films?? JG:You have more lines. But with that you have more lines to memorize. Mary Elizabeth Winstead: When you have a cast like John Goodman and John Gallagher Jr., there's never a dull moment with a small cast. It’s like a master class for acting, so it was amazing to be able to work with them and learn so much. NYC MOVIE GURU: How challenging was it to come up with the complex role that John Goodman plays, and to find the right actor for the role? MS: The drive of the screenplay, or the drive of the story was “Where does the truth lie?” You had to make him all different things. He had to terrifying in one moment and then he had to comforting in the next. He had to be true, too. He had to be authentic. It was a real tough balance. I couldn’t imagine anyone doing it better. He does have such intensity and at the same time levity and he brings it all, which is great. JC: I think it was important for us to play with genre expectations. I think that when people see a trailer they know what the movie is nowadays. Audiences these days are really savvy towards their entertainment. So we did our best to zig when people expected us to zag as much as possible, in the plot and with the characters. We pulled from a lot of different influences, as a result because we didn’t want to go down the same road that other people had previously. NYC MOVIE GURU: When did you decide to cloak the film's plot in secrecy and to make it part of the "Cloververse"? JC: We wrote an original screenplay, and it wasn’t meant to be a sequel. Cloverfield wasn’t in our minds when we wrote it. During the development process, the idea came up that it could be in the "Cloververse". Honestly, when we first started thinking about it, we were a bit surprised. But the more you think about, and as people start to see the movie, it will make a lot of sense, in terms of the tone and turns and twists, as well as the thriller aspect. So, we got really excited, because we knew it was the right choice to make.